Detailed at Telnets.org, a fan of Valve’s Portal series converted his computer room into a full-blown Aperture Laboratories office complete with a Cave Johnson oil painting, Test Chamber sign, lemon grenades and even a hidden message within the room. After leaving the home office beige for the last three years, he decided to give the entire room a theme rather than simply changing the paint color. While Nintendo’s Mario franchise was definitely in the running for a theme design, he eventually decided on Portal after seeing other DIY Portal designs on the Internet. For instance, Vector Farr’s bedroom made headlines after appearing on YouTube during late 2011. 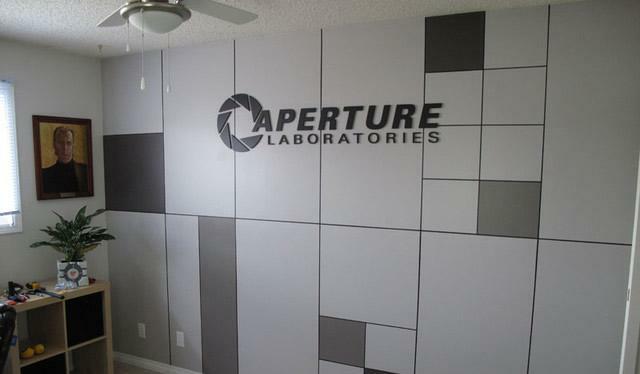 The main focal point of the room is the Test Chamber accent wall with a giant Aperture Laboratories logo. After designing a scale mock-up of the wall using CorelDraw, he masked off panels using string guides as well as painter’s tape before painting select panels to match the design of a typical Aperture Laboratories room. Using a vector copy of the logo, he shopped around with local sign makers until finding a company that would provide a paper template of the logo for less than $100. To the left of the accent wall, he wanted to hang a Cave Johnson oil painting. Voiced by actor J.K. Simmons within Portal 2, Cave Johnson is the founder and CEO of Aperture Science. While Thinkgeek has a similar portrait for sale, the Portal fan wanted to create something more unique for the home office. 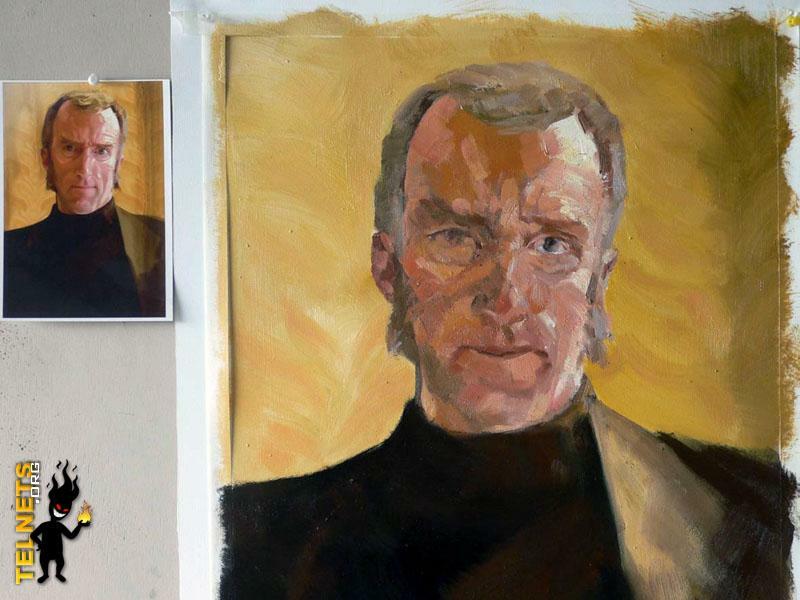 He hired an artist to create an oil painting of Cave Johnson from a photograph and mounted the finished version inside a 16”x20” wooden frame. At the bottom of the frame, he also fixed a brushed gold nameplate that says “Cave Johnson: Science isn’t about why, it’s about why not!” This portion of the project cost $105 plus shipping for the print. 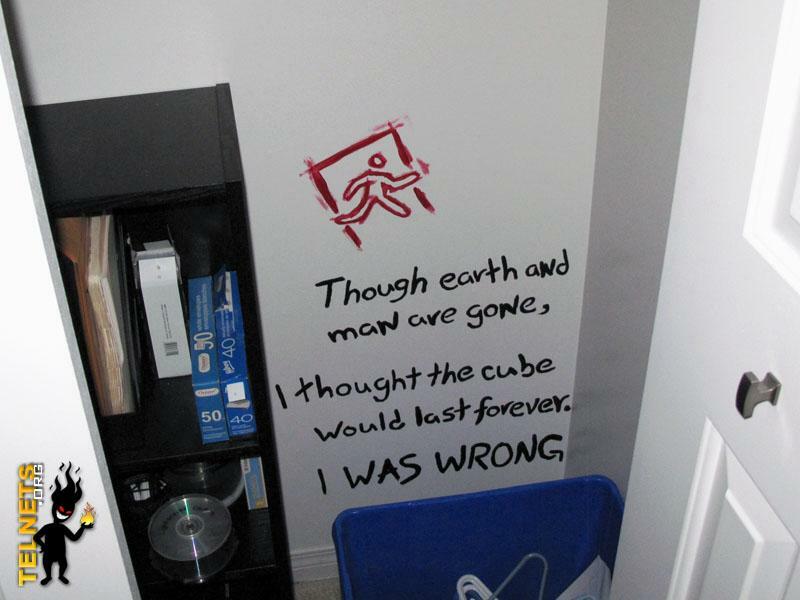 Next to the main desk on the opposite side of the accent wall, he mounted a lighted Test Chamber sign identical to the one found within the Portal games. With a budget of less than $100 for this portion of the project, he started with a 16”x31” shadowbox frame which he painted gray. To light the inside of the box, he used a 10 meter strip of LED lighting mounted to white foam core board which reflects much of the light when turned on. 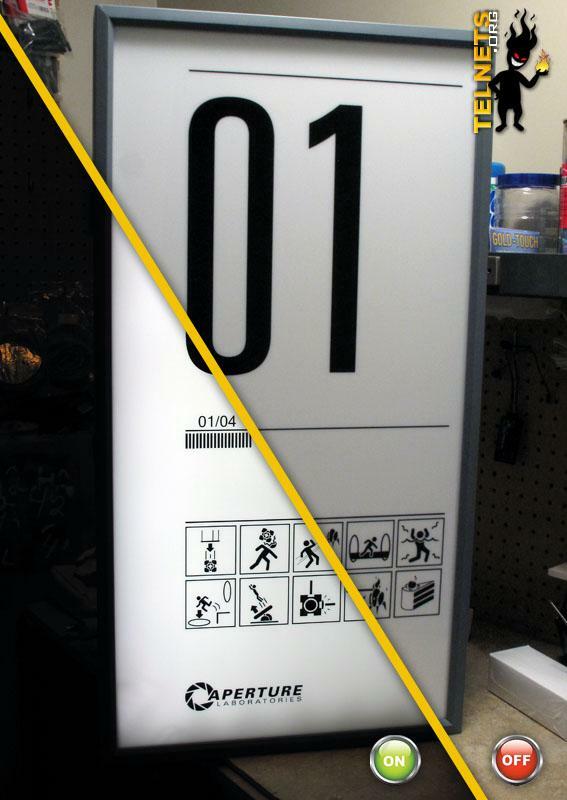 After acquiring a sheet of translucent white plexi-glass that was cut to the right size, he found the Test Chamber icons in vector format on the Web as well as the font used within Portal. After working up the project to scale in CorelDraw again, he sent off the layout to a friend with a vinyl cutter and eventually applied the sticky film to the front of the unit. The final DIY addition to the the Portal-themed home office are two lemon grenades. Taking about an hour to create, he purchased two fake plastic lemons from a crafts store as well as two inert grenades that he found at a local army surplus store. After applying a coat of paint to the top of the grenades, he cut holes in each lemon and screwed in the grenade tops as well as adding a bit of adhesive caulking. Using the vinyl cutter again, he created a stencil of the Aperture Laboratories circular logo and airbrushed that onto the side of the lemon. The entire project cost approximately eight dollars per lemon grenade. Other Portal-themed additions to the room include a Companion Cube cookie jar converted to a planter, a set of Portal bookends, a GLaDOS model and a “Don’t drink the water!” drink coaster. A full gallery of the project’s creation can be seen here.